everyone who wants to participate, does. Do you think your child will enjoy trick-or-treating, but are worried it may not be appropriate for them? If they tire easily, or have easily-triggered and unpredictable meltdowns, then plan a limited route close to home, or have another adult trail your crew in a getaway car. If your child has limited mobility or is in a wheelchair, scope out your trick-or-treat route ahead of time so you can note non-accessible houses and avoid them. 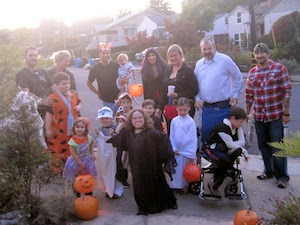 Please let us know your own Halloween tips, tricks, and successes. We hope your Halloween is a good one. We've kept this short, because our thoughts are with those of you who are not thinking of Halloween at all, or who have had Halloween rescheduled, due to Hurricane Sandy. If this is you, please let us know how you are doing and how our readers can help out.